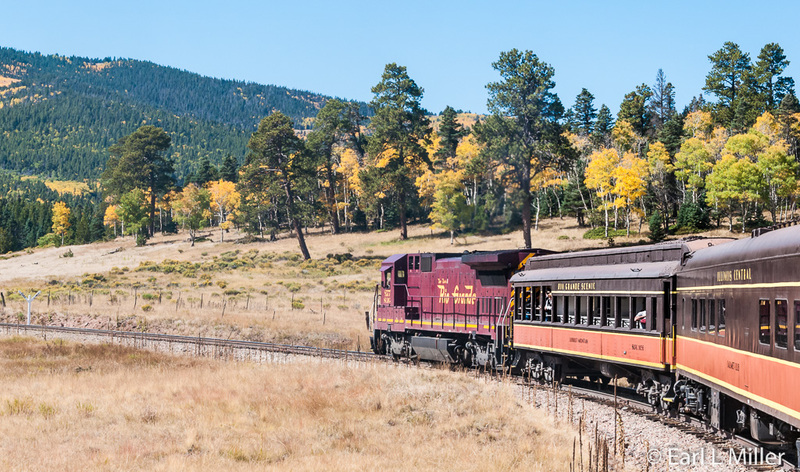 Colorado could easily be known as the queen of excursion railroads with eight different trips available in this state. 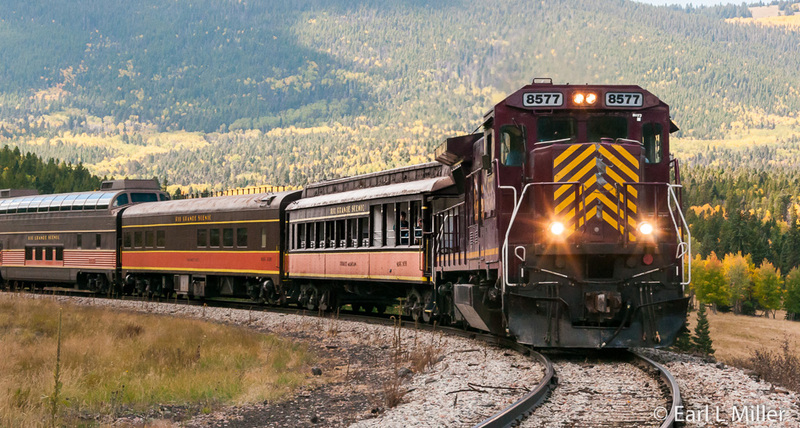 Some, such as the Silverton-Durango and the Cumbres Toltec, are well known when it comes to all day journeys. 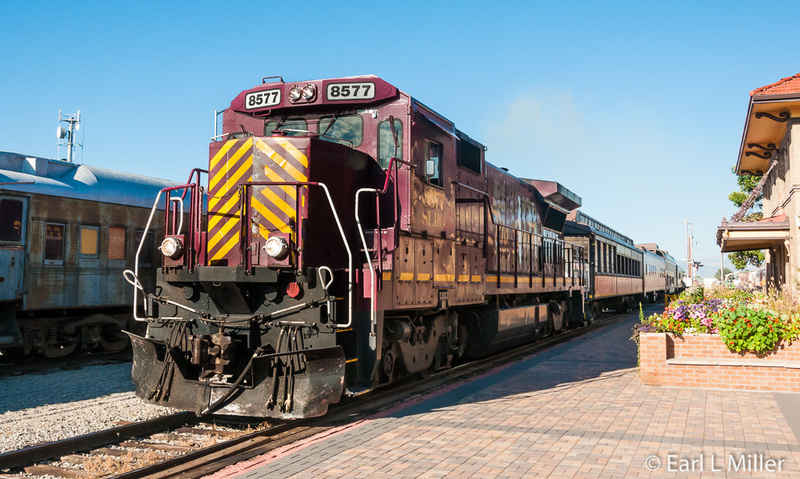 One which is quickly rivaling them is Rio Grande Scenic Railroad, in operation since 2006. 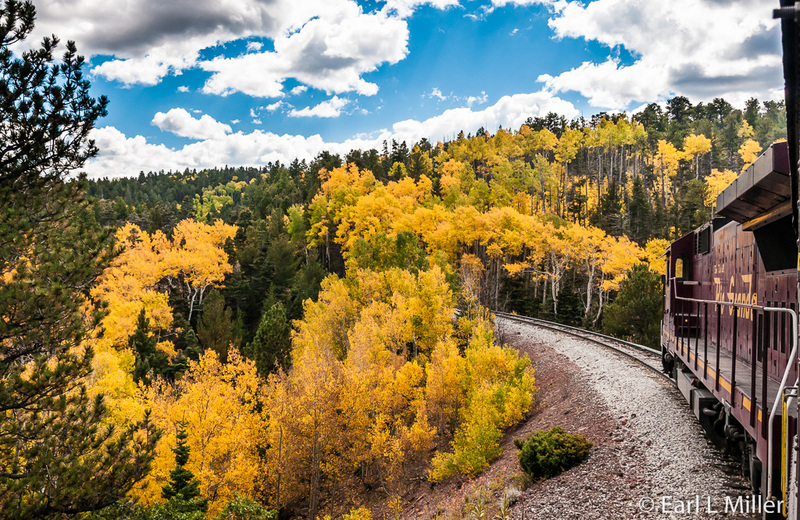 The train departs daily from Alamosa, from May 22 until September 13 in 2015, at 9:30 a.m. With a trip of 61.4 miles, you’ll travel on the longest and highest standard gauge railroad in Colorado. The train travels from Alamosa through farmland, two small towns, and foothills. You’ll then cross through La Veta Pass between the Culebra and the Sangre de Cristo Mountains. It then travels through the Catchword Valley, dominated by the Spanish Peaks, before reaching La Veta. Approximately two hours are spent in this artist colony town where you can explore its downtown shops and galleries. You then board for a return trip, returning to the Alamosa Depot at approximately 5:30 p.m. 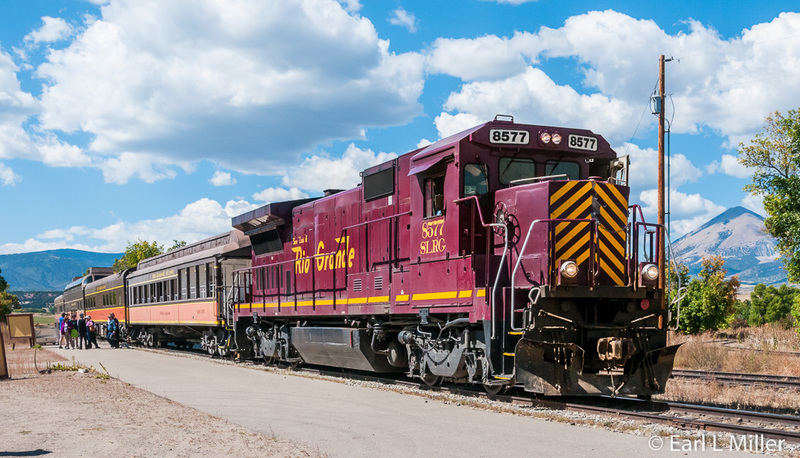 The railroad also offers special concert trains from Alamosa, on a 40-mile route to their amphitheater in Fir, on Saturdays and.Sundays, from June 13 through September 20. These are separate from the excursion trains. Concert trains depart about 10:30 a.m. from Alamosa and return to the depot around 5:30 p.m. The Mountain Rails Live outdoor concert lasts two hours. Throughout the season, about 30 performances take place. Most feature country, bluegrass, and cowboy artists. On July 4, 1878, the narrow gauge tracks reached Alamosa. Another train, full of assorted prebuilt buildings, arrived the same day from Garland City. It’s rumored the railroad crew had breakfast in Garland City that morning and were served dinner in the same buildings in Alamosa that evening. Within a short period, the Denver & Rio Grande established the town as headquarters for its narrow gauge operations. The railroad had an extensive construction, repair and shipping facility in Alamosa for many years. It was also the main supply and shipment point for southern Colorado and northern New Mexico, since it handled freight to and from the mining camps. Alamosa also housed the world’s only triple rail switch yard. The population topped 800 by 1880, making Alamosa the largest town in south central Colorado. By 1890, and for the following 50 years, Alamosa was the nation’s busiest narrow gauge rail hub. It had freight and passenger trains, arriving and departing from all directions - Denver, Durango, Santa Fe, Salida and Creede. Freight trains supplied the valley with ore, lumber, cattle, sheep, and farm products. Agricultural and mining products were shipped out. In 1899, after years of unsuccessful surveying, a route was worked out. The narrow gauge route had 4 percent grades and Mule Shoe Curve. The line was moved seven miles south, with standard gauge rail replacing narrow gauge rail over La Veta Pass and into Alamosa. The new route had no more than a 2.5 percent grade, with the help of a tight horseshoe curve, on the west side. The east side required a 3 percent grade in one section, trestles, and three tunnels. In 1929, one tunnel caught fire and caved in. The railroad cut through the tunnel roof along its length so it was “daylighted” (exposed to sunlight.) Today, these same standard rails are used for the Rio Grande Scenic Railroad. 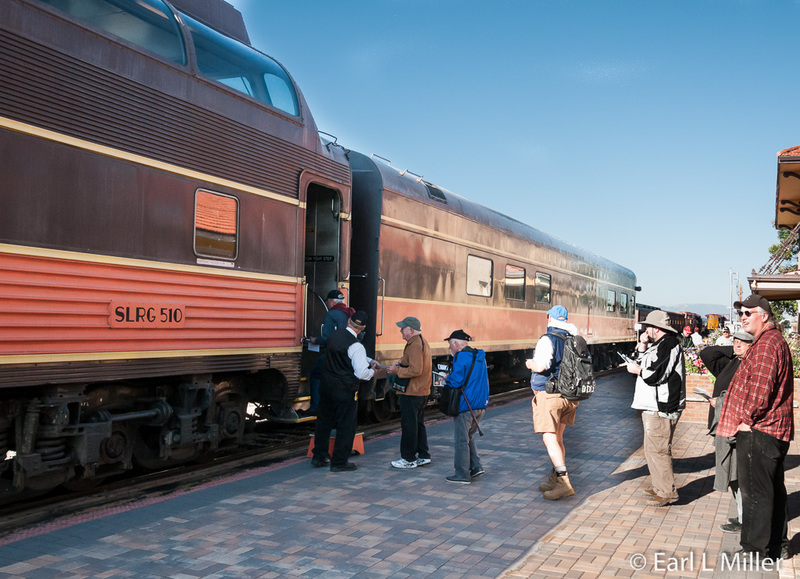 Originally, the Rio Grande Scenic Railroad’s excursion trains had different rates depending upon the class you chose. The company now offers all of its seats for a rate of $99 per adult and $89 per child for its excursion trains. People are allowed to move around from one car to another. Staff found this was much more popular than restricting people to a specific seat. You can obtain lunches, snacks, or beverages by ordering and paying extra from the wait staff in each car. No free food is provided, even in the club cars. Seating on the concert trains, since performances are included in the fare, has different rates, based on which of three levels you select. These are Diamond, First Class, and Standard. In First and Standard classes, the concert trains have snacks, like chips and candy, and beverages available for purchase to and from the concert site. At Fir, you can order a boxed lunch, a catered meal featuring barbecue beef and pork, or a selection of local beers. 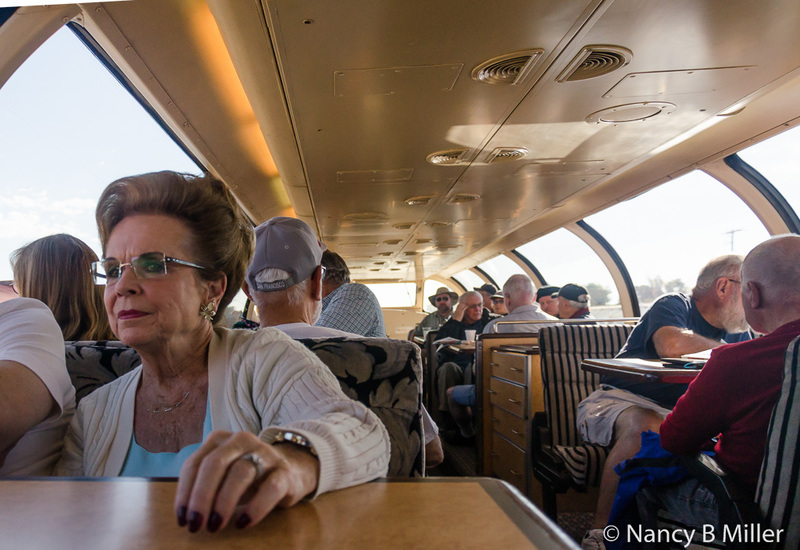 Diamond Class, on the concert train, involves seating in the Mardi Gras and Calumet Club cars. On weekend concert trains, these cars provide live music entertainment as they return from the Mountain Rails Live Concert Series stage at the Fir station stop. During their train trip, passengers have access to the bar and some light fare is included in their fare. Both club cars provided service on the Illinois Central Railway’s (IC) historic City of New Orleans trains between the train’s namesake and Chicago. That train is the same one that inspired Steve Goodman to write the famous folk song “The City of New Orleans.” It has been sung by such singers as John Denver, Willie Nelson, and Arlo Guthrie. It was awarded a Grammy as the Best Country Song of 1984. Besides having that in common, both cars were built by Pullman in 1918. Other than that, their history differs. When Amtrak took over the IC’s passenger trains in 1971, the Wisconsin and Calumet Railroad purchased the car and named it “Calumet Club.” It was then used by the Orlando and Mt. Dora Railroad in Florida, where it was stored, until acquired by the Rio Grande Scenic Railroad in 2010. In the late 1940's, IC converted a series of coaches into club and lounge cars. The Mardi Gras became a “round end” observation/club car when it was rebuilt in 1947. At that time, it received its current name and was regularly assigned to IC’s famous City of New Orleans train. In 2010, the Rio Grande Scenic Railroad purchased this car. 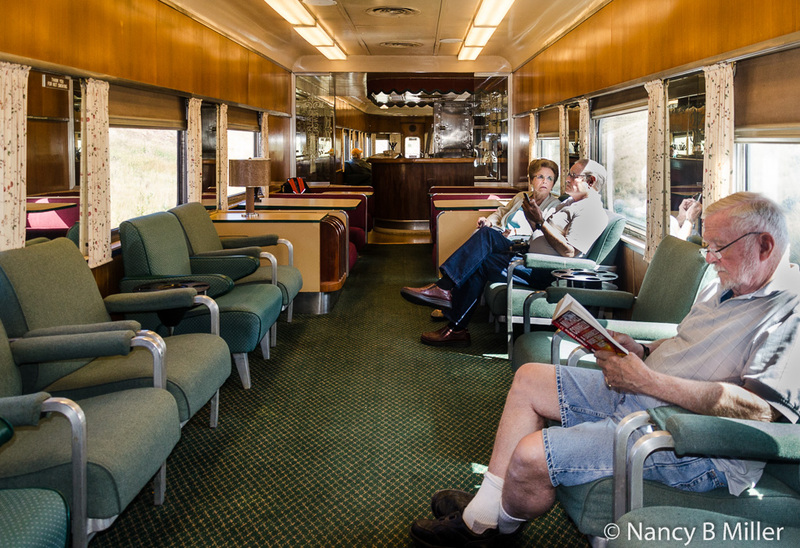 In First Class, the train has five two-level, glass dome cars. These are climate-controlled cars providing spacious seating. They were acquired by the Rio Grande Scenic Railroad in 2007 and started being used in 2008. 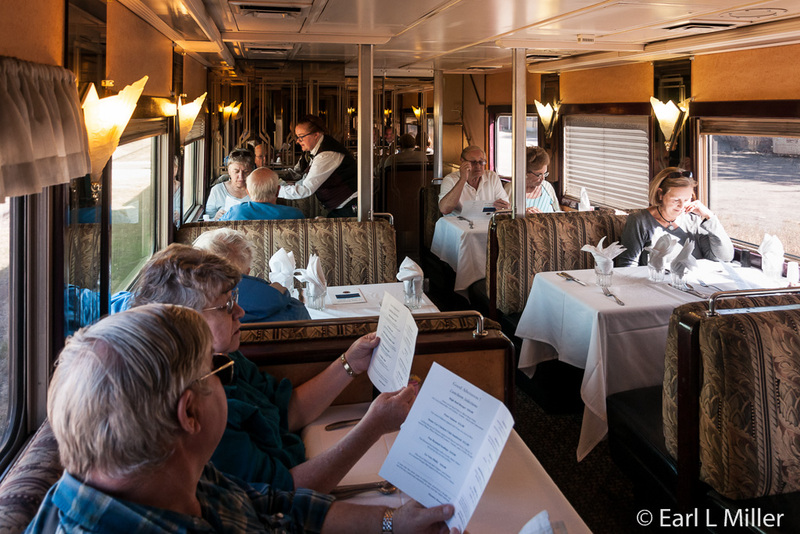 They originally served on the Santa Fe Railroad. 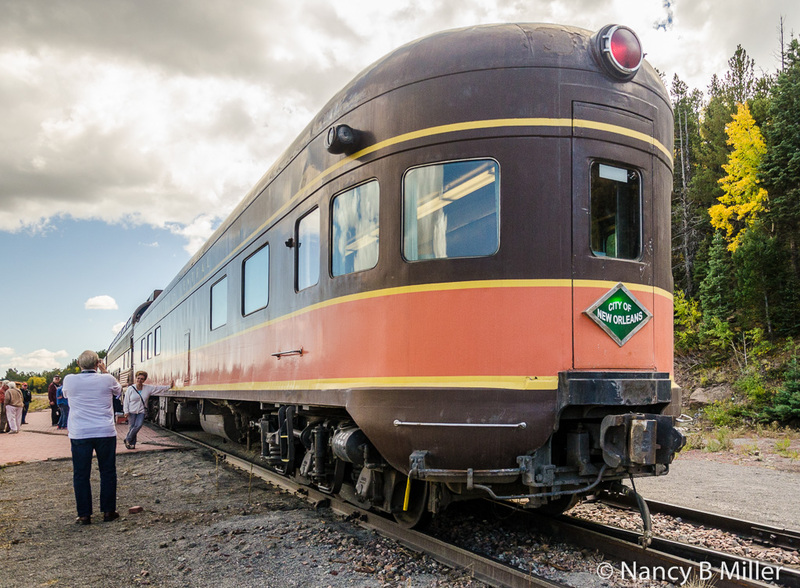 Over the years, they were acquired by a variety of long-distance trains before Holland-America Cruises used them for their land/sea passengers in Alaska. Dome cars provide table seating for 66 passengers, with four people at each table on top. A 22-seat dining area for lunch is on the bottom level, but the wait staff will also serve you on top. Again, the cost of your food is not included in your fare on excursion trains. The three open air cars are sometimes used as Standard Class. These provide for the best photography. There are no windows to block your camera. Snacks and beverages are available from attendants for this car. 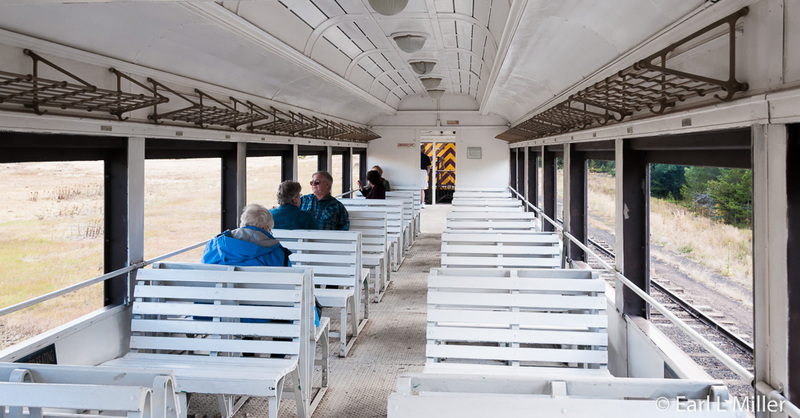 They’re historic rail cars built in 1916 by the Canadian Car and Foundry for the Canadian National Railroad. They were used on the Adirondack Scenic Railroad. The train uses diesel locomotives. General Electric manufactured the one on our train. These were built in the late 1980's and can reach speeds up to 70 mph. San Luis and Rio Grande, parent company of Rio Grande Scenic Railroad, uses them on freight and passenger trains. Before being part of the scenic railroad, they were used to haul coal in Eastern Kentucky. Our trip was their Fall Color Special. It consisted of the diesel locomotive, one dome car, an open car, and two club cars. While our train did not have a narrator, Jim Coulson, dome car manager, sometimes serves in that capacity. Instead, in our dome car, Dr. Rich Loosbrock, a professor of history, at Alamosa’s Adams State University spoke about the area’s history and pointed out what we were passing for the first 45-minutes of the trip. Besides the train ride, it incorporated two scenic photography stops. The first was on our way to La Veta when we stopped at Fir. We noticed the amphitheater where they hold the concerts. Then we watched and were able to shoot as the train backed down the mountain and came around the curve. A second photo stop was held after leaving La Veta which enabled those passengers who wished to exit the train and take shots of the Spanish Mountains. We stayed on board since we were still having lunch. We were offered cold drinks on the way over to La Veta and back. In our fare of $128 apiece, lunch was also included. It was our choice of five entrees, one side, and one dessert. We could select from four seatings: 11:00 a.m., noon, 3:00 p.m. and 4:00 p.m. We chose the 3:00 p.m. The regular lunch consisted of the following: burgers and Philly sandwiches, $10 each; salmon and the chicken club sandwich, $12 each; and scallops, $19. One additional side order from the menu, of your choice, comes with each entree. Desserts at $5 each are pies and tarts. We made good use of all the cars on the train. We began and ended our journey in the dome car. We then both photographed from the open car before reaching La Veta. On our return, Earl spent much of the rest of his time photographing from the open car while I relaxed on a comfortable chair in the coach car, conversing with the woman at the homemade soap concession. We ended our journey in the dome car, where they served a snack, and I chatted with staff members. We had hoped the fall foliage would be at its peak. Unfortunately, we needed to reach the mountains before we saw the golden hues of Aspen trees completely covering the landscape. What normally would have been brilliant color in the lower country was late in appearing. There are numerous mileposts (MP) on the trip that are particularly scenic. The mileposts are easiest to see from the open car and most difficult to spot from the dome car. MP 251 - After leaving Alamosa, the train enters extensive farming and ranching country. Coors Brewery grows a lot of their barley here. The area is the fourth largest potato producer in the nation. Hay, alfalfa, wheat, oats, hops, millet, and canola are also grown. Some farmers specialize in raising spinach, cabbage, lettuce, carrots, and pinto beans. Ranchers raise cattle, sheep, and goats. The federal government controls about 39% of the land in this area. We then passed the northern edge of the Alamosa National Wildlife Refuge. To the north/northeast, we spotted the sands of Great Sand Dunes National Park. Standing 750 feet tall, they cover 230 square miles. These are the tallest dunes in North America and are worth visiting while in Alamosa. MP 239.8 - You’ll pass Mt. Blanca. 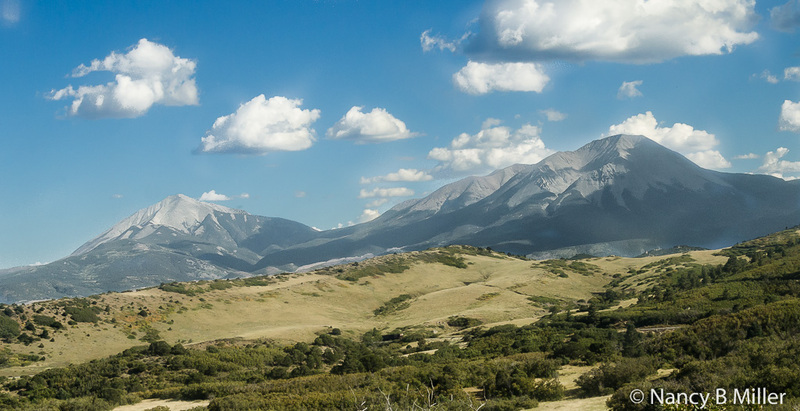 At an elevation of 14, 345 feet, it is the highest glaciated peak in the Sangre de Cristo Range. It is one of three 14,000 foot tall peaks you’ll see. Hamilton Peak is at 14,037 feet and Mt. Lindsey at 14,042 feet. MP 232.3, 227.8 - In less than three miles, you pass the town of Blanca followed by Fort Garland. Both are farming communities. At Fort Garland, you may want to return to check out the fort which operated between 1858 and 1883. Kit Carson commanded it in 1866 and 1867. The state historical society now runs it. From Fort Garland, the tracks follow Highway 160. To read an article on Fort Garland and the Great Sand Dunes National Park visit my August 21, 2012 article on the Cumbres Toltec Railroad, Fort Garland and the Great Sand Dunes National Park on this web site. 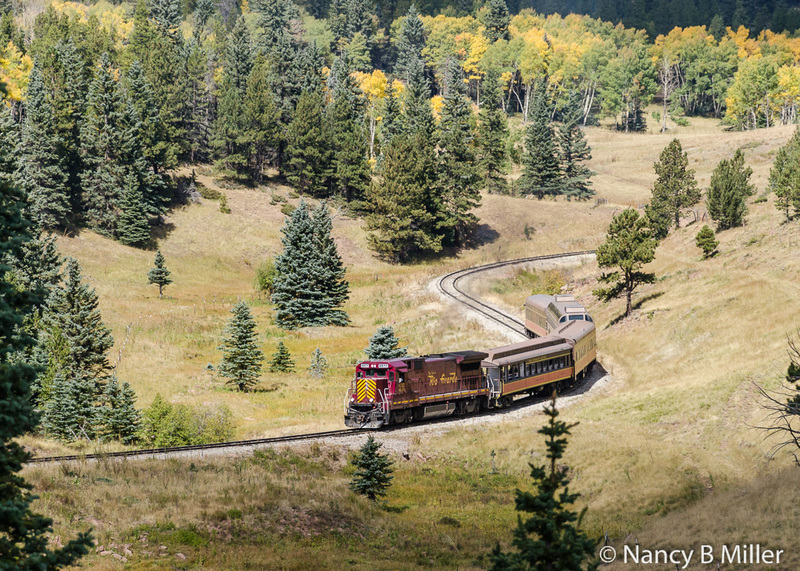 MP 224 - The train now follows along Sangre de Cristo Creek. You’ll pass willows and cottonwoods along this part of the route. You’ll also notice the light brown and tan colored sedimentary rocks of the Santa Fe Formation. MP 216.7 - As you leave the San Luis valley, the route turns away from the highway and climbs into the foothills along the south side of Wagon Creek. You’ll pass the point where it and Sangre de Cristo Creek flow into one another. 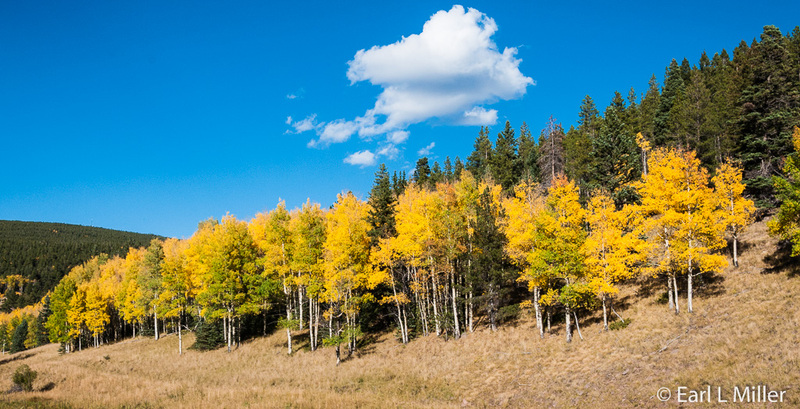 MP 211.5 - Now you’ll be seeing lots of aspens, along with some junipers and scrub oaks. You’re in a scrub oak mixed forest. MP 211 - Within a half mile, you’ll notice cottonwoods, pines, and Douglas firs. You’ve entered a spruce-fir forest. For 20 miles, the train runs through forests that are home to many animals. We spotted a deer. Others have seen elk and bears. MP 206.5 -This is where you start the Mule Shoe Loop. You can see remains of a track that connected with the upper curve across the Mule Shoe Loop. You’ll soon spot the remains of a corral and foundations of a large lumber camp’s loading platform located near the Loop’s center. 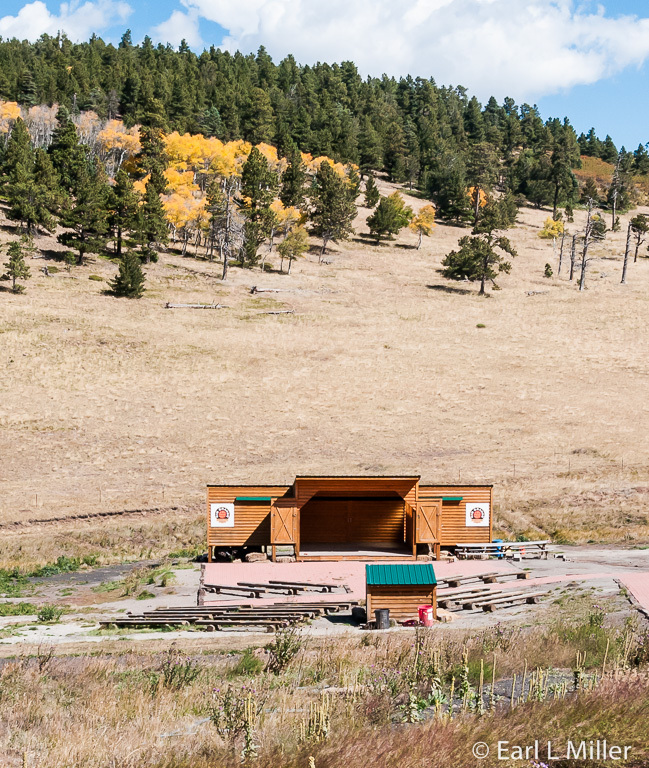 MP 207.2 - At Fir, you’ll see the depot and stage where Rio Grande Scenic Railroad conducts their summer concerts. It was once a small community with three lumber camps. The depot was originally called La Veta but had its name changed to Fir in 1932. MP 206.8 - At this milepost to MP 202, the route descends on a 3% grade to La Veta. The railroad recommends it as a good place to watch for wildlife - deer, elk, bear, maybe a cougar. MP 206.4 - You’ll see the west then east end of the Upper Tunnel that was “daylighted” in 1929. It took seven months to clear away rock and timber from the tunnel using mules and wagons. MP 206-205 - You’ll travel through the San Isabel National Forest. MP 202.2 - Next, you’ll enter the Upper Tunnel which is 343 feet long. In 1928, it was enlarged and lined because the tunnel’s rocks are prone to breaking apart. MP 200.6 - Stay alert for Elephant Rock which looks like an elephant. It was formed by erosion. Unfortunately, we weren’t quick enough to capture a photograph. MP 199.3 - You’ll now see photogenic views of the eastern plains as the track descends into La Veta. Scrub oaks are more common here. Cottonwoods and willows can also be seen. MP 198.6 - You go through the Lower Tunnel which is 655 feet long. MP 196.6 - Next, you’ll be passing La Maestra, a symmetrical shaped mountain. It’s in view for miles. That is an obvious mountain to recognize because of its majestic size. MP 195.5 - Watch for Cleopatra’s Needle formation. It reminded me of a Hawaiian Tiki in shape. MP 193.0 - The Spanish Peaks, which dominate the area, will be pointed out on your return. MP 190.3 - Finally, you arrive at La Veta station and town hall. Col. John M. Francisco came to the Valley in 1840. He built his plaza in La Veta in 1861 to serve as a ranch headquarters in 1861. He supplied nearby settlers as well as the gold miners around Denver. His plaza also provided protection from Indian attacks. La Veta was incorporated in 1876 when the railroad arrived. The plaza is now Francisco Fort Museum consisting of several late 1800's buildings. We were told by another passenger that he had checked and the museum was closed the day we were in town. Upon hearing this, we decided to stay in the park, next to the train, and chat with other passengers. Only cash is accepted at Fir at the food vendor’s cabin. Credit cards are accepted on board the train to purchase concessions. No coolers or your own alcoholic beverages are allowed on board. Alcoholic beverages are available on the train. It is mandatory to make reservations in advance, particularly for the concerts. Tickets are to be picked up prior to boarding on the day of your scheduled trip at least 30 minutes prior to departure time. Cancellations must be made prior to 48 hours before your train trip to receive a full refund. Within those 48 hours, no refunds will be made. However, your trip may be rescheduled for a later date. There are no refunds for Special Events trains. To make a reservation, call (719) 587-0509 or 1-877-726-7245. The Rio Grande Scenic Railroad’s depot is located at 610 State Ave in Alamosa. We learned that the San Luis Valley, through which we were traveling, is the size of Connecticut. It is about 100 miles long from north to south and runs 60 miles east to west. The area is more Hispanic than other areas of Colorado due to the valley once being the border between Mexico and the United States.